“Chairs were brought him wine between the floor, beside the guard plate stove aromatic dried meat, the taste is too attractive. Putting the meat in his mouth, feeling a bit stiff but tasty aromatic sweetness, chewing may feel Bui Bui, delectable. Lips on cup wine made from millet, warm feeling … suddenly spread both dry meat upstairs kitchen has a characteristic aroma and sweet taste as good as fresh meat blended with the smell of smoke and spicy characteristics, levels of concentration Spice”. Make a visit mountainous Kon Tum, you will have the opportunity to enjoy a unique culinary amazing that the ethnic minorities here. Dried meat hung kitchen can be made from all kinds of wild animals: deer, wild pig, cow, mouse, … But in many “gourmet” said the most delicious kind, “eat a piece of nostalgic memory” is meat deer and beef, this little two tendons meat, ivory white fat, sweet tender than chicken, while being “hung kitchen” and the sweet. I remember once going work on the storm Dakglei District No. 9 in early October 2009. The massive heavy rains, causing rivers to rise, the wind roaring in the jungle canopy, man blurred thick white a rain screen. Unable to return to the city, I had to stay in a friend’s house friend in Dak Man (Dakglei). Huddled in the cold of the storm, father friend rushed us fire heating, wooden house momentary flickering firelight warm pink. Wait for us to rest finished, he removed from the upstairs kitchen down a dark brown packets, introduced to me: “This is the venison hung kitchen, I love you so much they should eat new down there”. Speaking before he quickly buried in hot ash is drawn degrees 10 minutes, taking the wooden pestle small dams, this time a light fragrance emanates around, causing his stomach has not eaten anything all day my “rang demonstrators screamed” . Wine smashed their orders between the floor, beside the guard plate stove aromatic dried meat, the taste is too tempting. Putting the meat in his mouth, feeling a bit stiff but tasty aromatic sweetness, chewing may feel Bui Bui, delectable. Sip more wine cup made from millet, warm feeling suddenly spread all people. 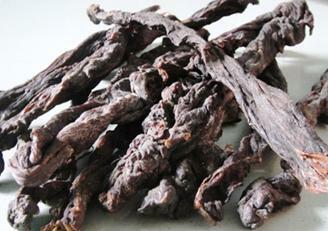 Dried meat hung kitchen with very characteristic aroma and sweet taste tasty as fresh meat blended with the smell of smoke and spicy characteristics, concentrations of spice levels. The fire flickering between a rainy night, the old father tells Meat dishes upstairs kitchen was a long time ago, from when they were born were seen guarding the kitchen with colored strings renders meat soot. However, because of the food ingredients are not available (usually when hunting wild game is the new big eaters saved), and a long processing time (at least 2 months) should Meat upstairs kitchen to reserved for festive occasions, plaited or when special guests come home, new people bring out guests. On the way upstairs kitchen Meat processing is very sophisticated, there are two main stages are marinated spices and bring the kitchen upstairs. 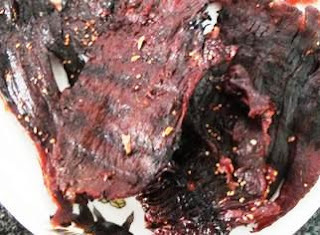 Material resources are wild boar meat, rat meat, venison, bear meat (small animal resembles a deer, very tasty meat), … After killing bush meat and clean, the people will filter flesh out into pieces with a width of about 7-8 cm, length 15 cm and 2-3 cm thick, gradually take baseball very soft wood. Spices minced lemongrass, ginger, garlic, pepper, salt to taste and mix with dark. In particular, in spices pepper indispensable forest (also called particle questions Khen) tastes tangy, spicy shredded tongue. Marinate the meat for 3 hours for spices soaked, then forced crackers hanging upstairs kitchen to smoked. Under the heat of the fire and soot clung, will gradually shrink the meat is dried, coated with dark brown appearance. Just let it be about 2 months is edible, the meat was sprayed on the seed spices. Meat processing upstairs kitchen completely natural, no preservatives, but to reserves in the long term. When brought down to eat, the people briefly roasted over charcoal or buried in ash for a while to heat up meat, shredding into smaller pieces. There were pieces of dry Thi delicious kitchen to hang this seems to put spices also can not “negligence” that makes simple, lessening the great good front. Ideally é grizzled leaf forest (a specific type of leaf spices usually grow along the stream, around the country). É leaves taste slightly acrid, mix with salty, add flavor to the meat completely dry kitchen upstairs. If it is difficult to find the user temporarily leaves é leaf vegetables were smashed crab, crab flavor but light as a leaf, not bold é. The rainy season in the highlands long time, in the house brown wooden floors, late flickering firelight, chewing slowly dried meat pieces upstairs kitchen, occasionally took a puff wine, yet still more fun ?! Enjoy Meat upstairs kitchen is a pleasant experience on a unique culinary culture, bring about profound aftertaste of Kon Tum mountains. Inside flaking wine, dried meat pieces as household kitchen upstairs add sweetness tasty, warm, rustic stories become shimmering, mysterious as the strength in the northernmost piece of land this beautiful Highlands.